All dogs need lots of care and love, but some require much more time and effort than others. If your plate is already full, but you still want to enjoy the company of a four-legged friend, look for a breed that is easy to groom and train, and that doesn’t require a lot of exercise. Here are 12 low maintenance dogs for beginners and busy people. 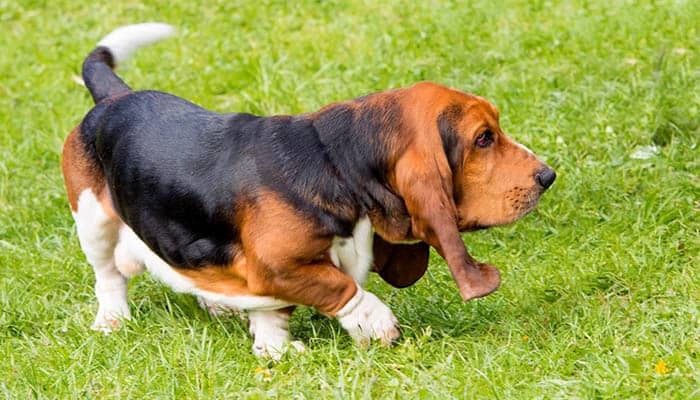 This adorable, slow-moving hound is a great family companion. Basset hounds are relatively easy to groom. They love to lounge around and take regular naps, but also enjoy a few short playtimes now and then. Daily walks are necessary to prevent obesity. Training them may prove a challenge, however, as they do have a stubborn streak. If you plan on leaving them alone for long periods, it might be a good idea to have another dog for companionship. Beagles are small, compact dogs with wonderfully expressive faces. They are pack dogs and thrive in the company of friends (human or canine). As puppies, they will need a considerable amount of training, since their curious nature may often get them into trouble. After this challenging phase, however, beagles will make great family pets and develop a sweet temperament. They are highly sociable and love making new friends. Grooming a beagle isn’t difficult, as their short coat requires brushing just a couple of times each week. This adorable and adaptable toy spaniel will fit right into your life. Cavaliers are not only affectionate and loving, but they also are intelligent and eager to learn new things. Keep training positive and fun since these sensitive dogs don’t respond well to negative reinforcement. While their coat needs regular grooming, Cavaliers don’t shed as much as other dogs. These gentle souls love walking and playing as much as they enjoy cuddling and spending time with their favorite people. This bright and alert dog comes in a tiny package. Chihuahuas are highly portable and can follow you just about anywhere. They make great companions for people on the go. On the other hand, leaving them alone for too long is not a good idea as they can get destructive; with adequate early training, they can learn and accept boundaries. They are quite active and playful, but their exercise needs are easy to meet. What’s more, grooming a Chihuahua shouldn’t be a problem, particularly for the short-haired variety. This dog is the fastest in the world, so running around and getting enough exercise comes with the territory. Apart from that, however, greyhounds are calm and affectionate, and they enjoy spending time with their family, snuggling on the sofa. Although people-oriented, they can be quite timid and shy, so early socialization is a must. Greyhounds are intelligent, so you will have fun training them, and their short coat makes them easy to groom. If you love the elegant beauty of greyhounds but would prefer a smaller dog, this breed is for you. Italian greyhounds are delicate dogs that reach no more than 15 inches in height. They have long slender legs and love running. Nonetheless, all exercise must be supervised to avoid injuries. Training can also be challenging, so patience is essential. While Italian greyhounds are naturally affectionate, they should frequently socialize to gain confidence. Labrador retrievers, although medium-sized, are quite strong. They love working and need vigorous exercise on a daily basis. While grooming them isn’t a laborious affair, there will be a lot of shedding, so you have to be prepared for that. Nevertheless, this amazing breed will make a loyal, constant companion. If you are looking for a best friend, someone to have adventures with, then you need to look no further. These dogs are smart and highly adaptable, so they will quickly grow accustomed to your lifestyle and home environment. These short dogs have a long history that dates back many centuries to Malta, where breeders developed the ideal companion dog. The Maltese, which is playful but not overly active, loves spending time with its owners and often becomes attached to them. These dogs are highly intelligent and easy to train, but if left alone for too long, they may become destructive. Their beautiful coat requires considerable upkeep, maybe even an occasional visit to a professional groomer. Although a daily brushing is a must, shedding is minimal. Pugs are funny, friendly and playful extroverts that get along with just about everybody: people, other dogs, even other pets. They are not especially energetic and don’t need a lot of exercise, but daily walks help them stay healthy. They are up for some fun and games, but they also enjoy hitting the couch with you. Grooming a pug involves nothing more than a weekly brushing and the occasional bath. These four-legged comedians make great companions for people of all ages. This happy, playful dog will always want to be the center of attention. Shih Tzus are affectionate companion dogs. They are energetic, though not extremely demanding of exercise. Of course, they love playing and exploring their surroundings, but most of all, they want to follow their human parent around. Shih Tzus are friendly and will do just fine with other pets. If you are looking for an easygoing friend to spend your whole day, this is the dog for you. These active little dogs come with huge personalities. Yorkies are full of self-importance, and they want everybody to know it. When they’re not the center of attention, they stay close to their favorite person. While they are full of affection for their family, they are reserved towards strangers. They are bright, intelligent, but also stubborn, and house training them will take effort. If you persist, however, you will have a well-behaved pooch in no time. This slender and elegant breed originated in England. Whippets are smaller than greyhounds but equally impressive. Not only are they fast runners, but they also are outstanding on agility and obedience courses. These dogs have no problem being indoors, however, and adult whippets are calm and quiet when they’re in the house. They are satisfied with just a weekly brushing and are good with children and other dogs. The decision to take on a canine companion is an important one that requires a good deal of thought and commitment. It may take some time to find the right dog for you, especially if you are a beginner, but once you do, you will have gained an amazingly loyal friend. If it’s the low maintenance dog breeds that you are after then this should be a solid list of 12 different options that you should consider.